If you follow some basic rules BitTorrent is without a doubt the best way to share large files online. Interestingly, BitTorrent's inventor Bram Cohen recently noted that torrents with more peers are not always faster. We give some pointers on what torrents will guarantee the best download speeds. In the past we’ve written many articles on how BitTorrent users can speed up their downloads. In most of these we focused on tweaking the client’s options such as the max upload speed and the maximum number of incoming and outgoing connections. Many BitTorrent users are looking for the holy grail that will boost their download speeds to the maximum, and tweaking your client can indeed help a bit. However, selecting the right torrents is far more important, and those are not necessarily the torrents with the most peers. Bram Cohen, the inventor of the BitTorrent protocol addresses this common misconception in a recent blog post. “Cohen designed BitTorrent to be able to download files from many different sources […] the more popular a file is, the faster a user will be able to download it, since many people will be downloading it at the same time, and these people will also be uploading the data to other users,” writes Cohen while quoting an erroneous article. So how do you get the most out of BitTorrent then? Or to put it differently, what torrents perform the best and generally give you the fastest download times? We’ll try to explain it as simply as possible leaving math out as much as possible. 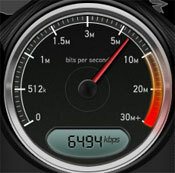 The fastest torrents will be those where downloaders (leechers) can tap into the most upload capacity. If you have a swarm (seeders and leechers) with a hundred people in total it will be faster when there are relatively more seeders. Why? Very simply it’s because seeders don’t download while their upload capacity is available for the leechers. Many people understand these basics. A torrent with 30 seeders and 70 leechers (30% seeders) will go faster than one with 10 seeders and 90 leechers (10% seeders). However, it get confusing when you compare swarms of different sizes. For example, a torrent with 30 seeders and 70 leechers (30% seeders) will generally be faster than one with 500 seeders and 2500 leechers (20% seeders). Why? Simply because the swarm has a smaller percentage of seeders. When picking the right torrents to download, the percentage of seeders that a swarm consists of is the most important thing to look at. A higher percentage of seeders means that the average upload capacity available to the leechers will be higher. The fact that leechers also upload themselves is irrelevant because all peers have more download capacity than upload capacity. The seeders make the difference. This is one of the reasons why private trackers generally have such great download speeds. Since users are required to seed as much as possible, they have torrents with 100 seeders and only two or three leechers. So what can we learn from this? If you’re looking for fast torrents pick those with the best seeder/leecher ratio or the highest percentage of seeders. Or when you don’t have a choice, don’t complain about slow speeds when there are only a few seeders in a large swarm. Perhaps even more importantly, remember to seed as much as possible if you don’t need your upload speed for something else. Will BitTorrent’s Paid ‘Fast Lane’ Violate ‘Net Neutrality’?